Stuffed Shells Fill 1 Created with Sketch. Ricotta (which translates to “recooked”) is made by reheating the whey separated from the curd during cheese making. The whey is allowed to ferment for up to 48 hours before boiling, which leaves behind a soft, mild cheese. 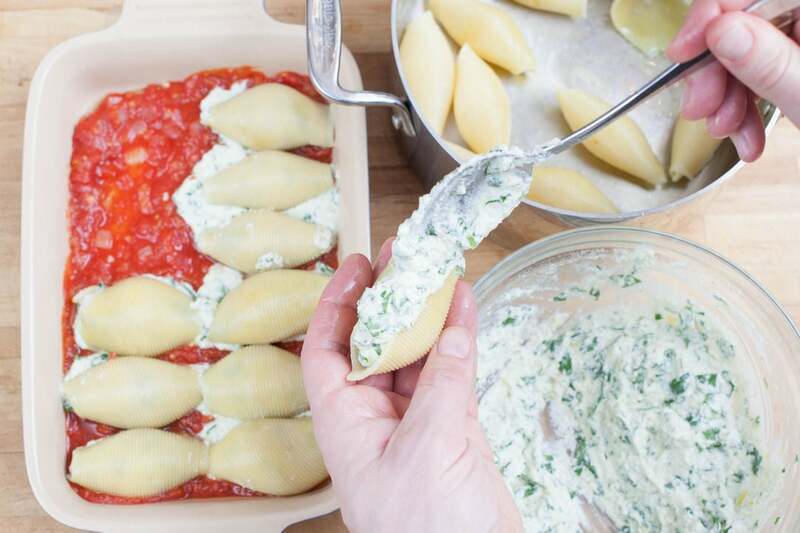 Ricotta is found in many dishes, including ravioli, manicotti, and of course — stuffed shells. Preheat the oven to 500°F. Wash and dry the fresh produce. Heat a large pot of salted water to boiling on high. Peel and mince the garlic. Finely chop the spinach. Pick the basil leaves off the stems. With a peeler, remove the peel of the lemon. 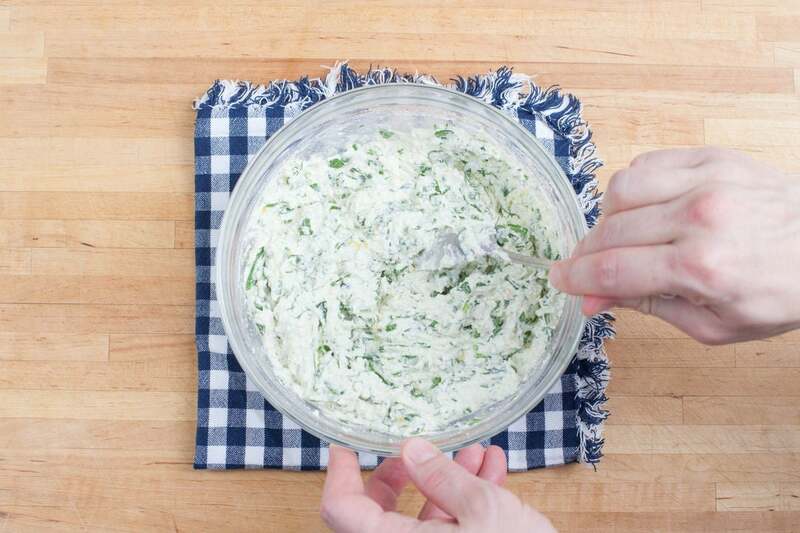 Finely chop the peel to make about 2 teaspoons of zest (or use a citrus grater). Cut the lemon into quarters and remove the seeds. Peel and medium dice the onion. In a medium pot, heat 2 teaspoons of olive oil on medium-high until hot. Add the onions and garlic for 4 to 5 minutes, stirring occasionally, until the onions are soft. Reduce the heat to medium and add the crushed tomatoes; season with salt and pepper to taste. 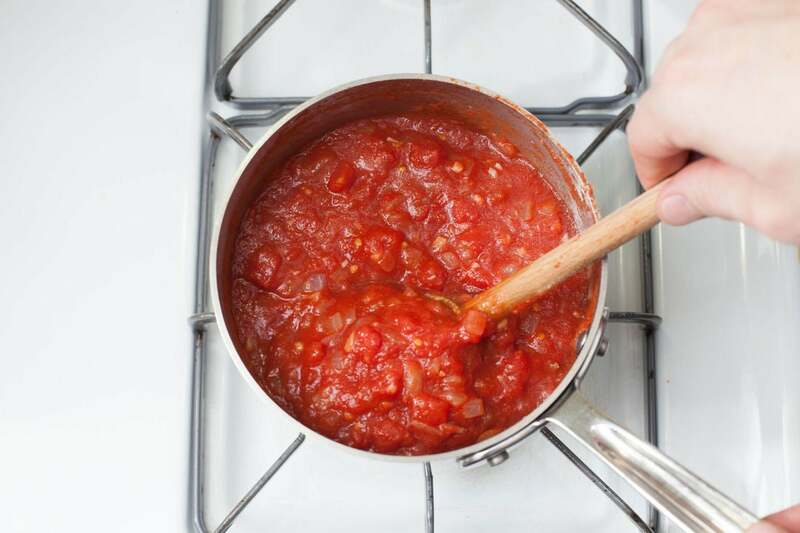 Simmer for 10 to 12 minutes, as you continue to cook. While the sauce is simmering, in a bowl, combine the ricotta cheese, egg, chopped spinach, cinnamon, lemon zest, lemon juice from all the lemon wedges, half of the Parmesan cheese and all but a pinch of the basil (roughly chopping, if you’d like). Stir until well combined, seasoning with salt and pepper. Add the shells to the boiling water and cook for 7 to 9 minutes, or until they are almost cooked through. The shells should still be slightly firm — this will help keep them together when you fill them. 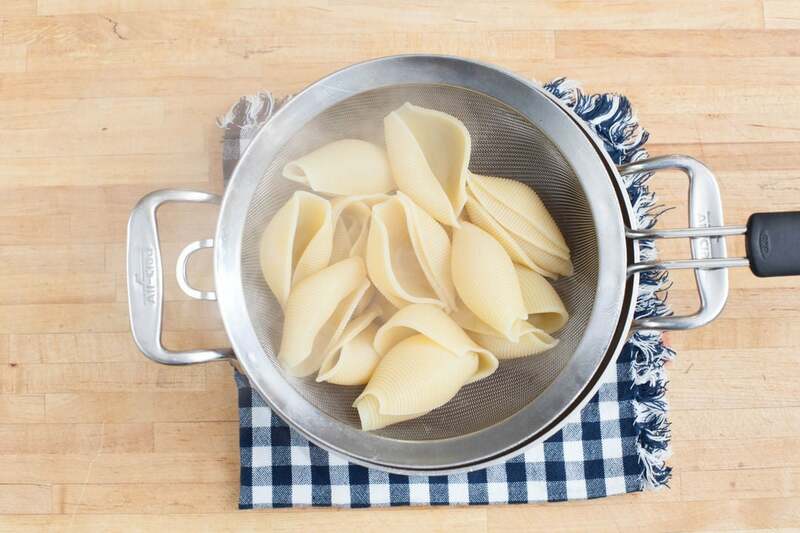 Carefully drain the shells and gently toss with olive oil to prevent sticking. Spread a thin layer of tomato sauce on the bottom of an oven-safe dish. 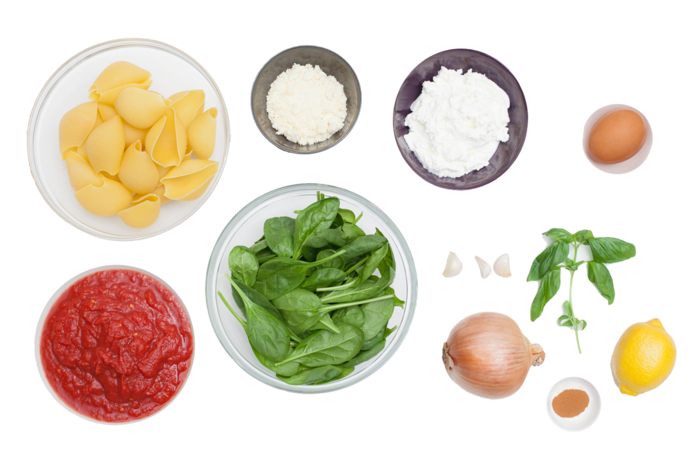 Then, working one at a time, fill each cooked shell with a generous tablespoon of spinach-ricotta mixture. (Keep a paper towel nearby to clean your fingers as you work to keep the shells neat.) Lay the filled shells into the baking dish in an even layer. 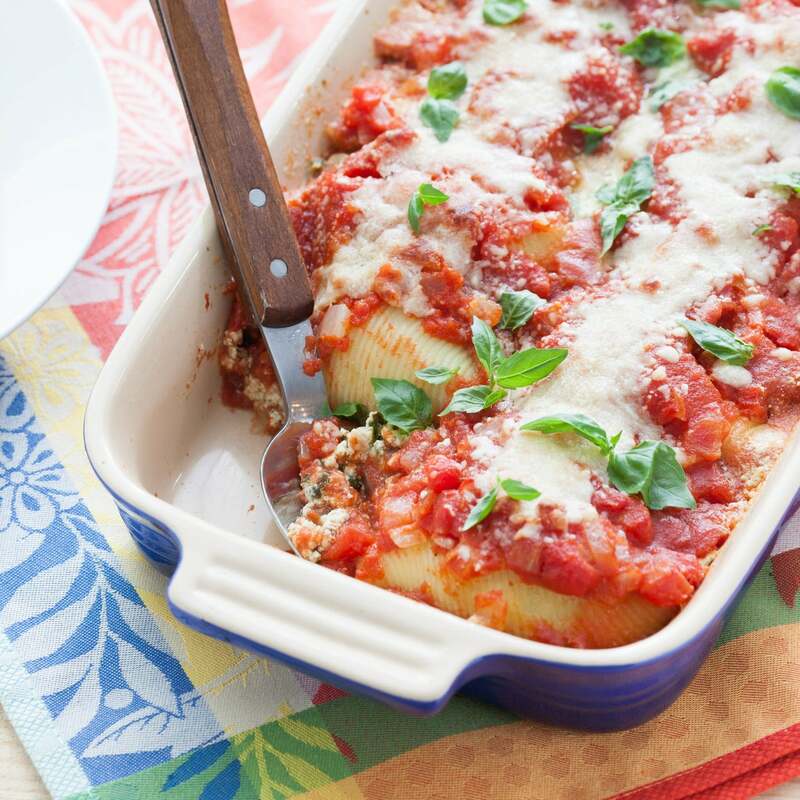 Spread the remaining tomato sauce on top of the shells, then top with the remaining Parmesan cheese. 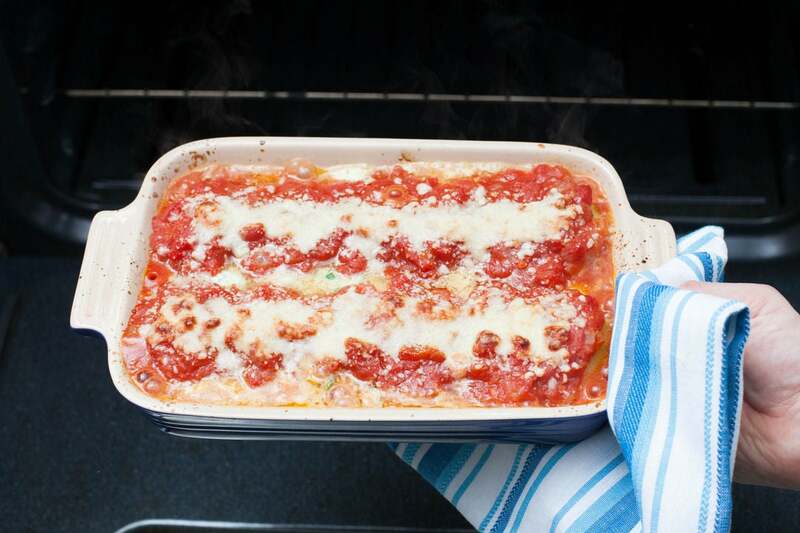 Bake for 12 to 15 minutes, or until the sauce is bubbly and the cheese is slightly browned. Remove from the oven and let stand at least 5 minutes to set. 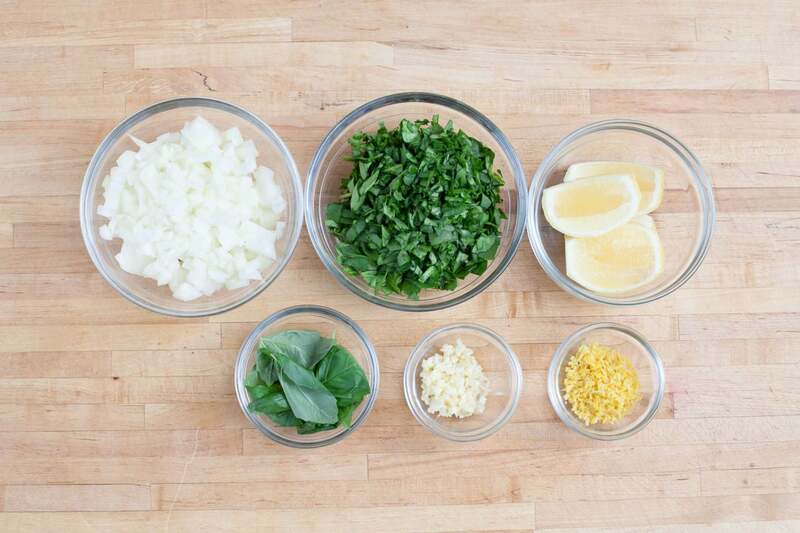 To plate your dish, scoop the shells onto each plate and garnish with the remaining basil leaves. Enjoy!